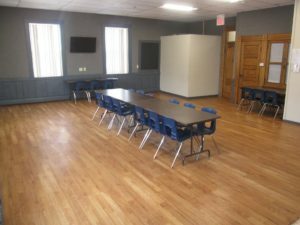 The Marion Gerrish Community Center has eight individual rooms available for groups of any size to use on a reservation basis. Detailed room descriptions and photos are available by clicking on the individual room listings below. Rooms must be reserved in advance of use and a completed room application is required. 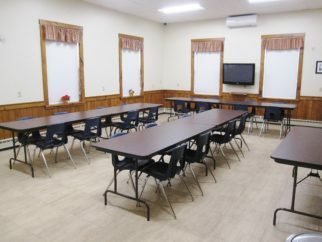 All rooms have at least one whiteboard, television and DVD player and a computer compatible projector is available to sign out for use during a room rental. The Center is completely handicap accessible with an exterior side entrance ramp, an elevator inside and handicap restroom on the first floor. Our rooms are used for non-profit organization and club meetings, birthday parties, baby showers, memorial services, business meetings and other private functions. We offer rooms for non-profit groups to use on a donation basis and we rent our rooms for private functions. For a basic room rental the cost is $60, for four hours, during normal operating hours. Room one has a full kitchen and the rental fee for this room is $120, for four hours, during normal operating hours. Our rates double on Saturday evening and Sundays. All of our room information and room applications/reservation information is listed below. 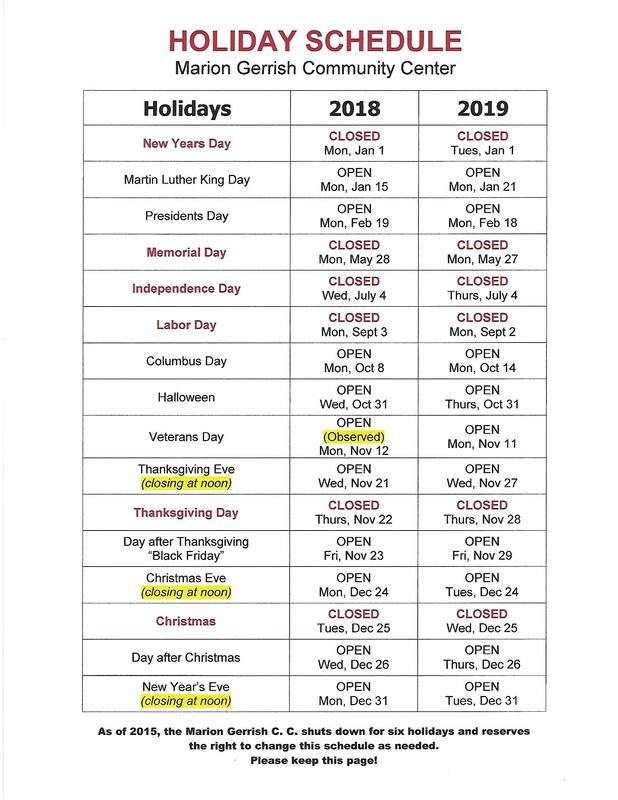 You can contact us via email at mgcc.derry@gmail.com or call 603-434-8866. Dedicated to Donald Ball, a longtime resident of Derry and a great contributor to the Center. This private room has a 6-8 person conference table and is perfect for board meetings, small business meetings and one-on-ones. Located conveniently just outside this room is a small kitchenette equipped with a microwave. All of our rooms have air conditioning and bathrooms are located in the hallways on each level. This our most popular room! Whether you are looking to host a private party, a group discussion or a business meeting this is the perfect multi-purpose space. Equipped with a complete kitchen and plenty of counter space, this room is perfect for entertaining any event. With a cabinet style whiteboard, pull down projection screen and a 40″ television you can easily display favorite photos or a presentation. A laptop-compatible projector and/or DVD player are also available to sign out when using this room. Located on the main level of our center this room seats 60. This room has six 72″ round tables, one 6′ rectangular table and 60 chairs available. All of our rooms have air conditioning and bathrooms are located in the hallways on each level. A spacious meeting room equipped with a whiteboard and pull down projection screen, this room is located on the main level of our center. 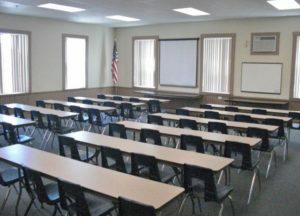 This room will hold up to 60 people; as shown here it seats 42. This room has double doors that can open to connect with room 2A for larger groups. A 42″ television is available in this room with a DVD player for presentations. A laptop compatible projector is also available to sign out when using this room. All of our rooms have air conditioning and bathrooms are located in the hallways on each level. Located on the main level of our center, this is a warm and cheerful meeting space that can easily be rearranged to suit any table configuration. This room will hold up to 60 people; as shown here it seats 30. The room has eight 6′ rectangular tables and 30 chairs, but we can provide more if needed. Double doors can be opened to connect with room 2 for very large groups up to 135. 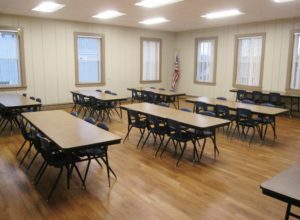 Equipped with a cabinet style whiteboard, 42″ television and a laptop compatible projector and/or DVD player are available to sign out when using this room. All of our rooms have air conditioning and bathrooms are located in the hallways on each level. This is a small room used during the weekdays for Rockingham Nutrition and Meals on Wheels. 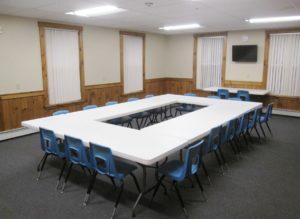 During the weekends and evenings, this room is used for small groups up to 10 people. All of our rooms have air conditioning and bathrooms are located in the hallways on each level. The perfect room to teach and learn! It has a class style setup with student tables. Equipped with a full-size projection screen, whiteboard and chalkboard, 40″ television and a laptop compatible projector and/or DVD player are available to sign out when using this room you can easily display favorite photos or a presentation. Located on the upper level of our Center, which is easily accessible via 2 staircases or elevator. Our largest room available, this can hold up to 100 people; as shown here it seats 48. This room has 14 tables and 48 chairs, but we can provide more if needed. All of our rooms have air conditioning and bathrooms are located in the hallways on each level. This large open concept room is available for a variety of uses. You can customize this room to meet the specific needs of your group, tables and chairs are available in the room for your set up. Located on the upper level of our Center it will hold up to 75 people. This room has double doors that can open to connect with room 5A for larger groups. It is equipped with two large whiteboards for assistance with presentations and a flat-screen TV. A laptop-compatible projector is also available to sign out when using this room. All of our rooms have air conditioning and bathrooms are located in the hallways on each level. 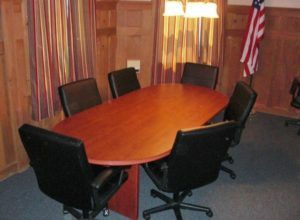 The circular table set up of this room is ideal for group discussions and interactive meetings. 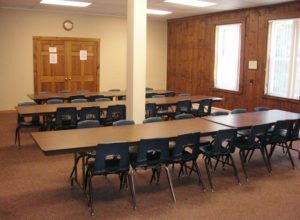 With a more intimate feel, this room is located on the upper level of the Center and is equipped with a cabinet style whiteboard and a 42″ flat screen TV. A laptop-compatible projector is also available to sign out when using this room. 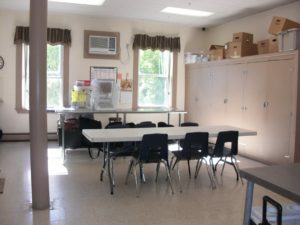 This room has double doors that can open to connect with Room 5 for very large groups. It will hold up to 60 people; as shown here it seats 18 All of our rooms have air conditioning and bathrooms are located in the hallways on each level. 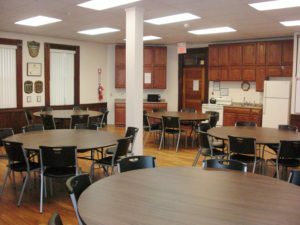 Located on the upper level of our center, which is easily accessible via 2 staircases or elevator, this room has 8 tables and 38 chairs, but we can provide more if needed. It is equipped with a whiteboard, full-size projection screen, a 42′ television and a laptop-compatible projector and/or DVD player are available to sign out when using this room so you can easily display favorite photos or a presentation. Conveniently located just outside this room is a small kitchenette which can be accessed through a unique pass-through window. The kitchenette has a microwave and counter space. This room will hold up to 85 people; as shown here it seats 38. All of our rooms have air conditioning and bathrooms are located in the hallways on each level. ur rooms can be rented for parties, business meetings, memorials, showers or private functions. Please complete the rental application after reading our room rules and return the completed application along with the room deposit fee. Please take note that we do not allow alcohol on our premises. Organizations, clubs, groups, and teams are able to use our rooms at no charge on a reservation basis, of course donations are always helpful for our operations! We currently have 150 groups using our building, but we always have room for more! Please complete the non-profit room application after reading our room rules.